Olive tree has very ancient roots and was brought to Italy by Fenicians first and then Carthaginians. It was considered in ancient times as symbol of peace and triumph, while its fruit was mainly used for rites and purification ceremonies, or consumed as a food or medicine. In the end of spring and beginning of summer trees begin to blossom and start to get covered in flowers and fruits (drupes), different from each other in shape and colour depending on the type. Rustichella d’Abruzzo was born and raised in the splendid Vestina area, in the inland of the province of Pescara. An area that not everyone knows and is located in the Tavo River valley, once full of mills and described by the poet Mamilio as “breast that provides milk and honey where no cereal, fruit or vegetable grows”. The advantageous hill microclimate guarantees the highest quality of an Extra Virgin Olive Oil recognised and appreciated in Italy and the whole world. 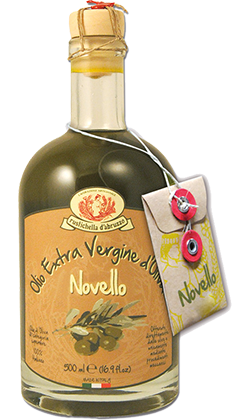 Novello Extra Virgin Olive Oil comes to life during olive harvest in October and November, when olives are not ripe yet. It is a unique product to be discovered, which conquests with its scent and aroma the most demanding palates of foodies from all over the world who cannot wait to taste the new production of the year. The local types Dritta (most representative cultivar in Abruzzo, with a slightly bitter and spicy taste and aftertaste of almond) and Leccino (that gives oil a fresh fruity scent of green apple) are harvested through a technique called “brucatura manuale” (hand picking) in order to preserve both the integrity of centuries-old olive groves and the high quality of olives. Try it on meat, fish, grilled vegetables and a hot bruschetta, or as main condiment of Rustichella d’Abruzzo Spaghetti with garlic, oil and chili pepper. Rustichella d’Abruzzo brings to your table its Extra Virgin Olive Oil, honoured in 2016 with two red leaves by Gambero Rosso. 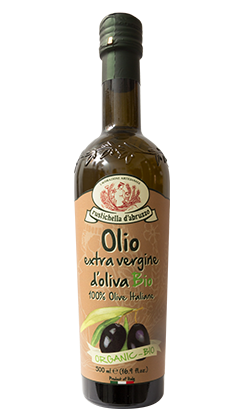 This olive oil has low acidity and a slightly fruity taste with sharp notes. The harvest technique through “brucatura manuale” and the following stone milling allow to preserve both the integrity of centuries-old olive groves and the high quality of olives, even from an organoleptic point of view. Rustichella d’Abruzzo brings to your table its Extra Virgin Olive Oil, in 3l Bag in Tube version, honoured in 2016 with two red leaves by Gambero Rosso. 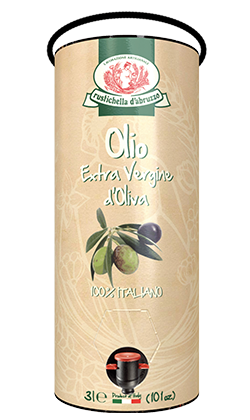 This olive oil has low acidity and a slightly fruity flavour with sharp notes. The harvest technique through “brucatura manuale” and the following stone milling allow to preserve both the integrity of centuries-old olive groves and the high quality of olives, even from an organoleptic point of view. 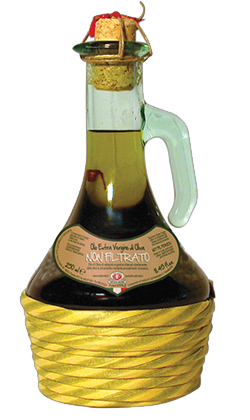 Rustichella d’Abruzzo brings to your table its Extra Virgin Olive Oil. 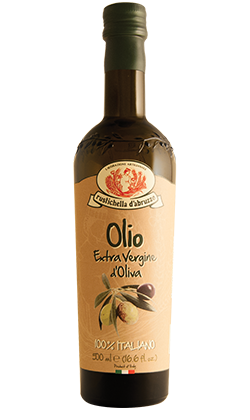 This olive oil has low acidity and a slightly fruity taste with sharp notes. The harvest technique through “brucatura manuale” and the following stone milling allow to preserve both the integrity of centuries-old olive groves and the high quality of olives, even from an organoleptic point of view. The best olives to make Rustichella d’Abruzzo Extra Virgin Olive Oil, harvested by “brucatura manuale” (hand picking) and stone milled, in the unfiltered version. An olive oil that has an intense taste which tells the important story of the strong and kind land of Abruzzo. 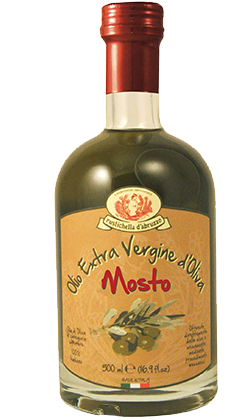 Mosto olive oil derives from the first production of Novello olive oil, an unfiltered extra virgin oil which preserves all of the extraordinary chemical-physical qualities of the local types Dritta and Leccino, with a strong and distinctive taste and intense sharp notes. It is perfect for grilled meat or for a dish of Rustichella d’Abruzzo polenta with local sausage, PrimoGrano “Pomodoro a Pera” sauce and Abruzzo’s Pecorino cheese.